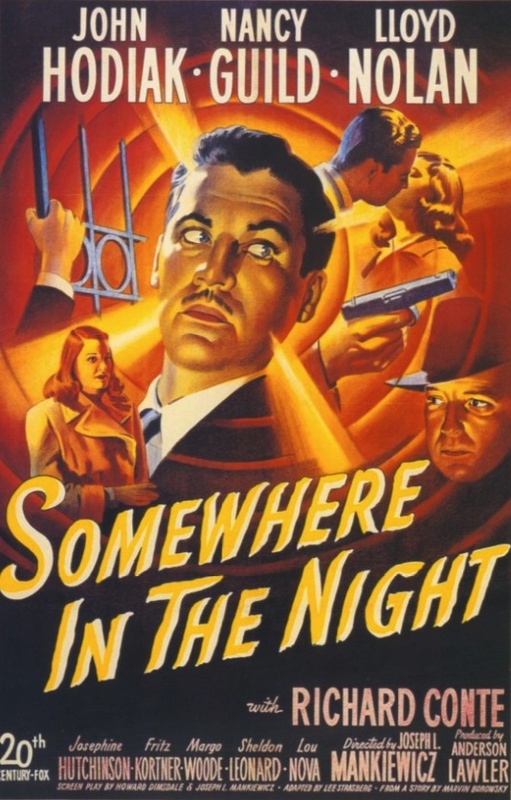 Joseph L. Mankiewicz’s Somewhere in the Night looks like a noir, talks like a noir, and walks like a noir. But when the credits rolled I felt more like I’d watched a light-hearted mystery farce than a noir. This isn’t to say that Somewhere in the Night is a bad movie. It’s actually a really fun one. But the dark journey promised by the film’s opening never pans out, and the plot twists grow increasingly ludicrous as the picture goes on. The first few minutes of the picture are mostly shot in first-person P.O.V., as a man (played by John Hodiak) wakes up in an Army field hospital. Through voiceover and the images in front of his face, we learn that he has no idea who he is, and doesn’t remember anything leading up to this point. This opening presages Robert Montgomery’s ill-advised first-person P.O.V. extravaganza Lady in the Lake (1947). Luckily, unlike that picture, the technique is used judiciously in Somewhere in the Night. Hodiak’s character has Army identification in the name of “George Taylor,” a Dear John letter (it’s really more of an “I Hate You, John” letter), and a letter of credit from someone named “Larry Cravat.” What’s a noir protagonist to do? Clearly, the best course of action is to head for the mean streets of Los Angeles and attempt to track down Larry Cravat, even though “Taylor” has no idea what he’s doing or who all these people are who seem to want him dead. Why should that stop him? Taylor is a Purple Heart recipient and seems to be able to handle himself. It doesn’t hurt that the briefcase he picks up in a Los Angeles train station contains a gun and a letter from Larry Cravat telling Taylor that there is $5,000 deposited in his name in an L.A. bank. For the first half hour or so, Somewhere in the Night has a few things to say about the plight of returning G.I.s, in particular the disappointments handed them by the women they came home to (or didn’t come home to, in Taylor’s case), and the resentment some servicemen must have felt upon their return. “You know there’s been a terrible shortage of men,” a beautiful young woman named Phyllis (Margo Woode) tells Taylor. But, as I said, the longer Somewhere in the Night goes on, the more plot points stack up, and the less time the film has to do anything but crank through its story. When Taylor goes to the bank to try and collect his $5,000 he arouses the suspicion of the cashier and he ends up fleeing empty-handed. He follows leads to a Turkish bath and then to a nightclub. Set up at the club by the bartender, he ends up hiding from a couple of mugs in the dressing room of a pretty singer named Christy Smith, who is played by the 20-year old Nancy Guild (rhymes with “wild”). Guild is fresh-faced, has a beautiful voice, and plays her role well. She’s not outstanding, but she does a good job, especially considering this was her first role in a film; not just as leading lady, her first film role, period. Apparently she felt out of her depth, and the production was a struggle for her. In later interviews, she credited Mankiewicz’s generous nature and sensitive direction, and said he was a real father figure to her. Hodiak also does a decent job, but it’s a one-note performance. He sweats profusely and looks haunted, and does a great job with lines like, “I’m tired of being pushed around. The war’s over for me. I don’t have to live afraid anymore.” He sounds genuinely angry, and he also sounds as if he doesn’t believe his own words one bit. It wasn’t until after I finished watching Somewhere in the Night that I learned that while Hodiak was born in the United States, he grew up in an immigrant family, spoke Hungarian and Polish at home, and always had to work hard at his English diction. “No part has ever come easily to me,” Hodiak once said. “Every one has been a challenge. I’ve worked as hard as I could on them all.” I never would have guessed from this film that his first language wasn’t English, but there is something about his delivery that is strange and stilted. Luckily, Guild and Hodiak have wonderful support from two great actors who straddled the line between character actor and leading man; Lloyd Nolan and Richard Conte. Somewhere in the Night is a good picture; well-made and a lot of fun. It was all just a little silly for my taste, though. Posted in 1946, June 1946 and tagged 20th Century-Fox, Anderson Lawler, Clancy Cooper, Darryl F. Zanuck, David Buttolph, Film Noir, Fritz Kortner, Houseley Stevenson, Howard Dimsdale, Jack Davis, James B. Clark, John Hodiak, Joseph L. Mankiewicz, Josephine Hutchinson, Lee Strasberg, Lloyd Nolan, Lou Nova, Louis Mason, Margo Woode, Marvin Borowsky, Mary Currier, Milton Kibbee, Mystery, Nancy Guild, Norbert Brodine, Richard Conte, Sheldon Leonard, Somewhere in the Night, W. Somerset Maugham, Whit Bissell. Bookmark the permalink. 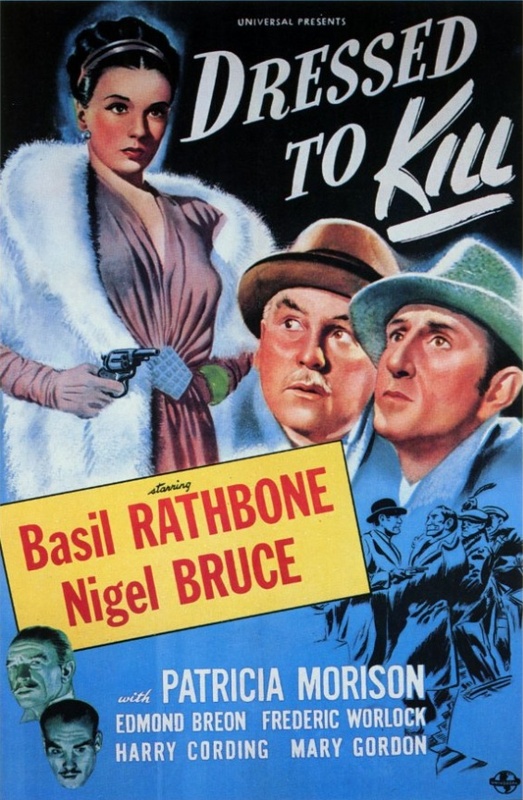 Dressed to Kill was director Roy William Neill’s eleventh Sherlock Holmes film, and the fourteenth and final film starring Basil Rathbone as Holmes and Nigel Bruce as his loyal sidekick Dr. John H. Watson. This was the year that Rathbone said goodbye to the character. His last appearance on the Mutual Broadcasting System radio program The New Adventures of Sherlock Holmes was in “The Singular Affair of the Baconian Cipher,” broadcast on Monday, May 27, 1946. The next week’s time slot was filled with the summer replacement program The Casebook of Gregory Hood, which starred Gale Gordon as an antique dealer and gourmand living in San Francisco who solved mysteries in his spare time. Like the Sherlock Holmes program, the scripts were written by Holmes aficionados Anthony Boucher and Denis Green. The show was fun, but Gregory Hood was no Sherlock Holmes. Holmes returned to the airwaves in October, on the American Broadcasting Company. Nigel Bruce reprised his role as Dr. Watson, but Tom Conway took over the role of Sherlock Holmes (although Bruce received top billing). Rathbone, who felt that his association with the character, whom he had played on a regular basis since 1939, was killing his career, so he returned to New York City and the theater. He won a Tony in 1947 for his role in the Broadway play The Heiress, but little significant stage work presented itself to him in the years to come. He had bad luck with films, as well. When The Heiress was made into a film in 1949, Rathbone hoped to appear again as Dr. Sloper, the role for which he had won a Tony, but the part ended up going to Ralph Richardson. The boys receive a visitor to 221b Baker Street, Julian “Stinky” Emery (Edmund Breon), an old friend of Watson’s. Emery is an avid collector of music boxes, and was robbed the night before. Curiously, the thief (or thieves) knocked him unconscious and then took just one music box, a trifling little thing that Emery had purchased earlier in the day at auction for just £2. We, the viewers, know that Emery’s music box was one of three manufactured in Dartmoor Prison, so we know that the trio of miscreants tracking them down in London have an ulterior motive, in this case, finding where a pair of original Bank of England plates are hidden, which they will be able to use to produce £5 notes that are not “counterfeit” in the traditional sense. The three music boxes all seem to play the same tune, but with his fine ear for music, Holmes will note minor variations in the melodies, which is the key to the code. Dressed to Kill features many plot elements that will be familiar to long-time viewers of the series. Mrs. Hilda Courtney (Patricia Morison) is a clever femme fatale in the mold of the eponymous antagonists of The Spider Woman (1944) and The Woman in Green (1945). And the plot device of a number of cheap trinkets holding a code was used before, and to better effect, in The Pearl of Death (1944). Dressed to Kill is far from the best of Universal’s Sherlock Holmes series, but it’s far from the worst. The Rathbone Holmes pictures are remarkably consistent and terrifically entertaining, however, so the worst picture in the series is still better than most mysteries from the ’40s. Posted in 1946, June 1946 and tagged Basil Rathbone, Carl Harbord, Dressed to Kill, Edmund Breon, Frank Gruber, Frederick Worlock, Harry Cording, Holmes Herbert, Howard Benedict, Ian Wolfe, Leonard Lee, Leyland Hodgson, Mary Gordon, Maury Gertsman, Mystery, Nigel Bruce, Olaf Hytten, Patricia Cameron, Patricia Morison, Roy William Neill, Saul A. Goodkind, Sherlock Holmes, Sir Arthur Conan Doyle, Universal Pictures, Wallace Scott. Bookmark the permalink. When it comes to Poverty Row westerns, there’s a fine line between watchable and unwatchable. I didn’t dislike Ghost of Hidden Valley, and even enjoyed a lot of it. I can’t say whether that’s because it’s a slight cut above other Poverty Row westerns distributed by P.R.C. (Producers Releasing Corporation) that I’ve seen lately, or because my expectations were ground down to a nub by the three other movies directed by Sam Newfield that I’ve watched in the past year. One of the most prolific directors of all time, Newfield directed more than 250 movies in a career that spanned almost 40 years. Martin Scorsese once said, “Newfield is hard, that’s a hard one, you can’t do too much of that.” This from a man well known for his insatiable appetite for films of all kinds. I’m a fan of economical storytelling, even when it’s outlandish. There is no ghost, of course, and we won’t see any more cattle, either. There will be some weak-sauce comedy in which the grizzled and toothless Fuzzy Q. Jones (Al “Fuzzy” St. John) will mistake the calls of a hoot owl for the spectral cries of a wandering spirit, but that’s it. After Dawson and his rustlers commit murder, we see cowboy Billy Carson (Buster Crabbe) and his friend Fuzzy at the post office in Canyon City, Arizona. Fuzzy has received a letter from someone named Cecil Trenton. (It comes addressed to “Fuzzy Jones, Esq.”) Cecil’s late brother, Sir Dudley Trenton, spoke well of Fuzzy, as well as his sojourn in America generally. “It was his wish that his son Henry, a young gentleman just out of Oxford, should experience a bit of the rugged life and devote some attention to the property Sir Dudley purchased in your vicinity,” Cecil writes. “What is this Oxford he just got out of, a penitentiary?” asks Fuzzy. Henry Trenton (John Meredith) is exactly what you might expect. A fey, snooty-accented tenderfoot wearing a checked shirt, vest, ten-gallon hat, and ridiculous sheepskin chaps. “I always make it a point to dress correctly,” he says. He even has an aristocratic butler in tow named Tweedle (Jimmy Aubrey). Billy sees the potential of Hidden Valley Ranch, if only someone could knuckle down and work it properly. Will Henry Trenton be that man? Ghost of Hidden Valley is a typical P.R.C. western, with plenty of shootouts, chases on horseback, and furniture-destroying fistfights to fill out its 56-minute running time, but at least it’s briskly paced. Also, the female lead (Jean Carlin) is pretty, unlike the last Crabbe P.R.C. western I saw, and the script by Ellen Coyle is breezy and relatively entertaining. There’s still Newfield’s trademark sloppiness and inattention to detail for the viewer to contend with. For instance, there’s one scene in which Crabbe’s skinny stunt double, his loose shirt hanging out of his pants, takes a punch, there’s a cut, and the next shot is of the real Crabbe, his chunky torso unmistakable, and his shirt tightly tucked into his jeans. Crabbe was my main problem with this film. No longer the dashing young actor he was when he played Flash Gordon in the ’30s, Crabbe phones in his performance, has trouble mounting his horse in at least one scene, and generally looks as if he’d rather be somewhere else. 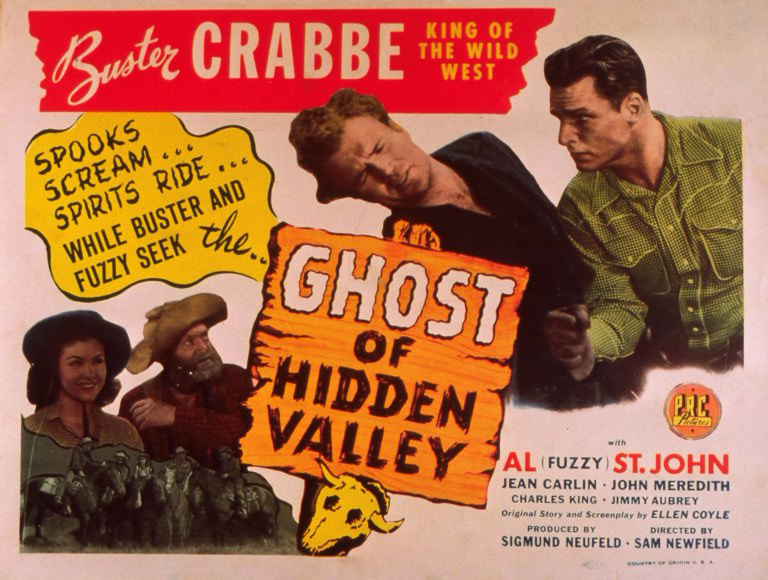 Posted in 1946, June 1946 and tagged Al "Fuzzy" St. John, Art Reed, Buster Crabbe, Charles King, Ellen Coyle, Ghost of Hidden Valley, Holbrook N. Todd, Jean Carlin, Jimmy Aubrey, John L. Cason, John Meredith, Karl Hackett, Lee Zahler, P.R.C., Sam Newfield, Sigmund Neufeld, Silver Harr, Westerns, Zon Murray. Bookmark the permalink. The Stranger isn’t most people’s favorite Orson Welles film, and a lot of people even consider it his worst. (Welles did.) It’s the third film he directed, and as far as Oscar bait goes, it certainly pales in comparison with Citizen Kane (1941) and The Magnificent Ambersons (1942), but I think a lot of the criticism heaped upon it is unfair. The Stranger is a crackerjack thriller with tension and suspense to spare. I was drawn in by the first scene, and was completely involved throughout the film’s 95-minute running time. Despite its sometimes hackneyed script and implausible situations, The Stranger shows a master in complete control of his craft. The first 15 minutes of the film are some of the most perfect cinematic storytelling I’ve ever seen. Mr. Wilson (Edward G. Robinson), an investigator for the Allied Commission for the Punishment of War Criminals, sets free a Nazi war criminal named Konrad Meinike (Konstantin Shayne) and has him tailed, believing that he will lead them to the secret architect of the Holocaust, Franz Kindler (Welles). Kindler is living in the idyllic little town of Harper, Connecticut, under the name “Charles Rankin” and is a professor at a boy’s school. Meinike’s journey to find Kindler is an object lesson in how to tell a story with a minimum of dialogue and a maximum of tension. The shots are visually arresting, the editing is rapid without ever being confusing, and the pacing is fast. As openings go, it’s not quite the bravura performance Welles would later put on with his single crane shot that opens Touch of Evil (1958), but it’s just as good in its own way. The disconnect only appears during the first lengthy stretch of dialogue. Once Meinike tracks down Prof. Rankin, the clumsy exposition that Welles grumbles through — which explains who his character is, whom he is marrying, and who his father-in-law will be — sticks out like a sore thumb. Meinike will prove to be just the beginning of Rankin’s troubles. The noose tightens around his neck as soon as Wilson arrives in town, posing as a dealer in antiques. Robinson plays his role well, in an understated fashion that contrasts nicely with Welles’s bug-eyed histrionics. After a few extreme close-ups of Rankin’s sweaty face as he tells lies to convince his new wife, Mary Longstreet (Loretta Young), that he is an innocent hounded by nefarious forces, there is no doubt about the depths of his villainy. Not that there every really was any doubt, since Rankin behaves in such a despicable fashion throughout the picture. It’s not just his dinnertime conversation — in which he explicates the warlike soul of the German people and denies that Karl Marx was a German because he was a Jew — it’s his willingness to engage in wet work, killing a troublesome character without a second thought and later beating his new wife’s dog when it attempts to dig up the corpse. In his review of The Stranger in the July 11, 1946, edition of the NY Times, Bosley Crowther wrote that Welles’s performance “gave no illusion of the sort of depraved and heartless creatures that the Nazi mass-murderers were. He is just Mr. Welles, a young actor, doing a boyishly bad acting job in a role which is highly incredible — another weak feature of the film.” Again, I think this is unfair. Welles got his start in the theater, and as a thespian, he never really grew out of it. His acting was always highly theatrical. He was a man who played to the back row, with grand gestures and a booming voice, but he did so extremely effectively. Not every film performance has to be subtle and understated. It’s his work behind the camera, however, that really shows Welles in top form. The fast cutting in a scene in a diner, for instance, creates a tense subtext beneath Loretta Young’s seemingly casual banter with Edward G. Robinson by showing each character’s motivations by the looks on their faces. Mary is hiding something, Rankin is coercing her into doing so, and Wilson knows exactly what is going on. Director Welles and editor Ernest J. Nims make it all look easy, but it’s not, or more films would be this well-made. The film also brilliantly uses sound. For instance, the tolling of the clock in the village square (which the clock-obsessed Rankin has fixed) underscores the tension in the film’s final half hour. The bonging of the clock has a peculiar timbre, and sounds more like incidental music from a ’70s or ’80s suspense or horror flick than any soundtrack from the ’40s I’ve ever heard before. The score itself, by Bronislau Kaper, is quite good, too, and is reminiscent of the work of Bernard Herrmann. The screenplay, by Anthony Veiller, from a story by Victor Trivas, was imposed on Welles by the studio. The studio and the producer, Sam Spiegel (listed in the credits as “S.P. Eagle”), made plenty of other decisions Welles didn’t like. For instance, Welles wanted Agnes Moorehead to play the part of Wilson, but they forced him to go with Robinson. 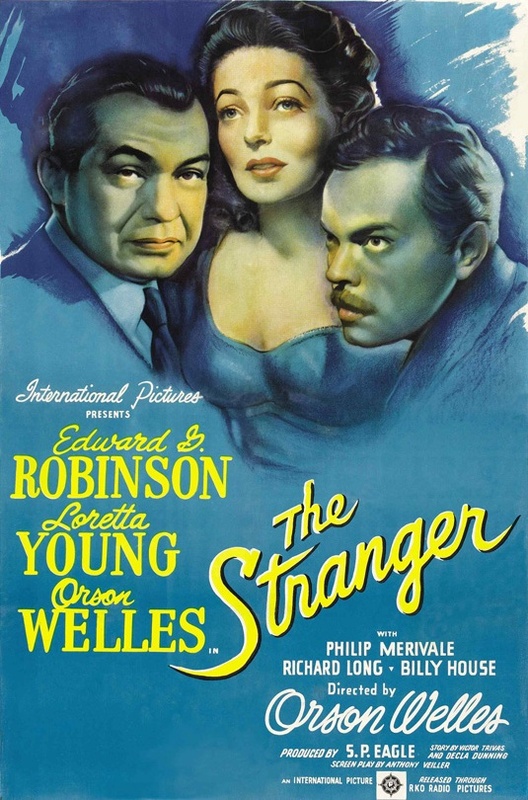 As far as the studio was concerned, however, everything worked out for the best, since The Stranger was the only film Welles directed that ever made a profit during its initial theatrical run. The Stranger is a potboiler, to be sure, but it’s such a brilliantly edited, directed, and acted potboiler that it’s remarkable. This is one of those rare movies that I looked forward to seeing again as soon as it was over. Posted in 1946, May 1946 and tagged Anthony Veiller, Billy House, Bronislau Kaper, Brother Theodore, Byron Keith, Decla Dunning, Edward G. Robinson, Ernest J. Nims, Espionage Thrillers, Film Noir, International Pictures, Isabel O'Madigan, John Huston, Konstantin Shayne, Loretta Young, Martha Wentworth, Orson Welles, Philip Merivale, Pietro Sosso, Richard Long, RKO Radio Pictures, Russell Metty, S.P. Eagle, Sam Spiegel, The Stranger, Victor Trivas, World War II. Bookmark the permalink. 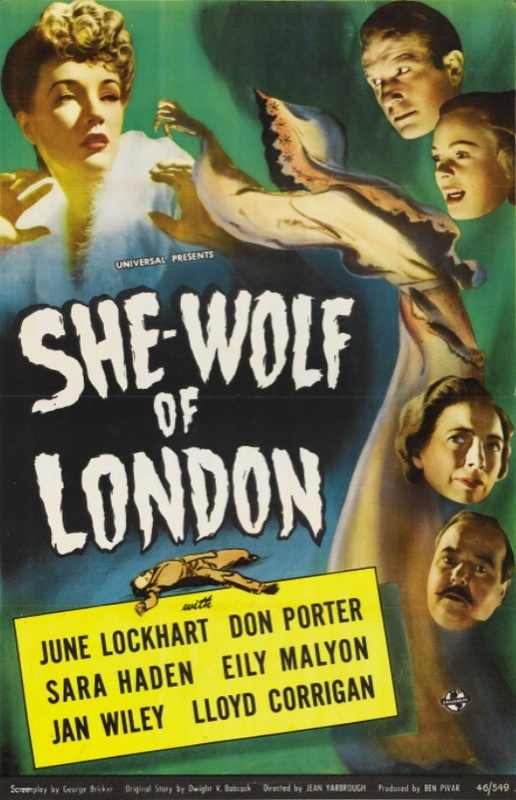 Jean Yarbrough’s She-Wolf of London is a passable way to while away an hour after the A feature has run its course, but that’s about it. By the mid-’40s, Universal’s horror department was looking pretty moribund. The last truly outstanding horror film Universal Pictures released was probably The Wolf Man (1941). After that, there were several Mummy, Dracula, and Invisible Man sequels and spin-offs, as well as a couple of everything-but-the-kitchen-sink monster mashes, House of Frankenstein (1944) and House of Dracula (1945). Most of them were fine, campy entertainment, but none of them approached the truly outstanding horror pictures that Universal produced in the ’30s. This picture is similar in many ways to Devil Bat’s Daughter (1946), which I watched a few weeks ago. (Incidentally, Jean Yarbrough, who directed She-Wolf of London, also directed the original The Devil Bat in 1940.) Like Devil Bat’s Daughter, She-Wolf of London is a horror film with every last drop of the supernatural squeezed out of it. Sure, there are a few teases here and there, and the foggy atmosphere is thick, but as soon as a young girl in a film who’s set to inherit a fortune starts to think she’s crazy, five’ll get you 10 she’s being manipulated by someone. She-Wolf of London takes place in turn-of-the-century London. The Allenby Curse has almost been forgotten, but this is a Universal horror picture, so it’s all set to rear its ugly head again. (The curse has something to do with members of the Allenby family assuming the form of wolves, but the film is vague about the details.) Phyllis Allenby (played by June Lockhart, who is best known to legions of baby boomers as the mom on two classic TV series, Lassie and Lost in Space) is a young woman who just wants to marry her sweetheart, Barry Lanfield (Don Porter). When a series of brutal murders committed by a woman wearing a cloak and hood occur in a nearby park, Phyllis fears she is killing people at night and forgetting everything when she wakes up in the morning. All the evidence of cinematic lycanthropy is there — the muddy footprints leading back to the bed, the blood on the hands — but, as I said, she’s an heiress on the verge of inheriting a vast fortune, so you can bet she’s being gaslighted. Even for what it is, She-Wolf of London is stunningly predictable, right down to its easy-to-spot red herrings. It’s notable only for taking a relatively serious approach to its material long after most of the studio’s horror films were pure camp. But that, in itself, is another problem. As an exploration of the psychosexual motivations that might drive a murderess, the picture falls completely flat. Cat People (1942) this film is not. Posted in 1946, May 1946 and tagged Ben Pivar, David Thursby, Dennis Hoey, Don Porter, Dwight V. Babcock, Eily Malyon, Frederick Worlock, George Bricker, Horror, James Finlayson, Jan Wiley, Jean Yarbrough, June Lockhart, Lloyd Corrigan, Martin Kosleck, Maury Gertsman, Olaf Hytten, Paul Landres, Sara Haden, She-Wolf of London, The Wolf Man, Universal Pictures, Warren Jackson, William H. O'Brien, William Lava. Bookmark the permalink.